But Mummy does not want to go quietly into that good night of women with sensible haircuts who 'live for their children' and stand in the playground trying to trump each other with their offsprings' extracurricular activities and achievements and boasting about their latest holidays. Funny and very relatable . Made me laugh out loud a lot. Narrator was great! Let me preface my review by noting that the author pulls no punches when it comes to extremely "salty" language. So this novel probably is not for the faint of heart. For everyone else ... read on! I have very high standards when it comes to humor. TV shows, books written by comedians, my husband ... the exceptions are few and far between. When I read reviews promising laughs galore, I'm skeptical. So, Why Mummy Drinks is a rare and precious find. I actually not only laugh out loud - a lot - but even throw my head back to do so, every now and then. The narrator's interpretation, pacing, and deadpan delivery, are simply tailor-made for this novel. Because the author is British, many of her expressions and expletives are not commonly used here in the US ... but they are simply spot-on and I long to incorporate them into my own salty repertoire. Ms Sims takes stock characters - perfect moms, latter-day hippies, intrusive relatives - to the next level. And her writing style is a treat, as well - the phraseology, the similes, etc - are delightful. In short - if you are a free spirit with a sense of humor, this Bud is for you! 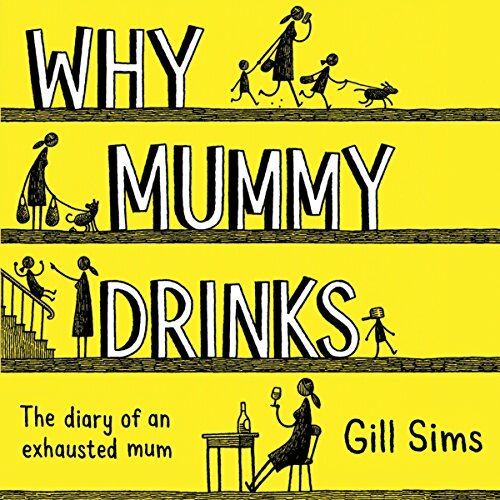 Would you listen to Why Mummy Drinks again? Why? Absolutely. It was just that funny to me. And i don't even drink. Ellen. I think we (mothers) think like her we just don't say it. And she loves her dog - what could be better? What does Gabrielle Glaister bring to the story that you wouldn’t experience if you just read the book? She did an excellent job with the voices. I never review books but I felt I had to with this one as i very much enjoyed this book. If you enjoy British comedy DO NOT let this book pass you by. I laughed out loud many times while driving down the road. If you change the narrator to a black woman from the south then this would basically be the soundtrack of my life. Why Mummy Drinks makes me feel so much less crazy but simultaneously makes me realize how crazy I look to everyone else all at once. But I love this book and I absolutely recommend it to Mums everywhere. Turns out we're all a little nuts. This book gives plenty of good laughs. And who doesn't like humour? What was one of the most memorable moments of Why Mummy Drinks? Her recollection of the first time she made dinner for her husband. She's very expressive, bringing the character to life. I laughed out loud over and over again It's certainly not for the faint hearted but it is bloody funny! Could listen to this eleventybillion times! If you are an imperfect mom, wife, or friend listen on. Ellen is as real and funny as they come. I don’t re-listen to many books in my library but I go back to this one weekly and still have laugh out loud moments. I cant wait for Why Mummy Swears to be released! I really enjoyed this book. It was a refreshing take on being a working mother & all types of modern issues! A very nice book to listen to and a very very fond sense of yes me too....Loved it! great performance of sparkly, profane and hilarious rendering of modern English family ways. luv it.